After an endless six months, I’m able to tell you that our local council has finally approved our building design and okayed us to start on our new little house. Whew. So the waiting and anxiety is over and we can get started…not. In the meantime, our builder, Rico, as could be expected, has become busy on somebody else’s build because nobody knew when (or if) the council would award building consent. However, this necessary delay has afforded us the opportunity to see the type of construction we’ll be using before we are involved in our own build. We met up on site with Rico and Neil, the expert who will do the earth reshaping to produce a flat area for the house and terrace, the garage and some sort of ramp to allow trucks to bring building materials needed up to the building site. He’ll build retaining walls to hold the hillside off the house; he also will be in charge of the concrete floors and the block work for part of the garage and back wall of the house. Best of all, his work can be done in the summertime when the ground is dry and well before Rico is free from his current responsibilities on his current build. We walked over the hillside pointing out which trees must be saved (like our 500 year old pohutakawa tree, duh…) and which must go for access to the site. Neil promises to keep the trunks for our wood-burning stove. Not that we think we’ll need much extra heat – our architect has designed the house for so-called ‘passive solar’ heating, aiming that sunshine will provide natural heating, absorbed by walls and floors during the day, then given out in the evenings and nights. 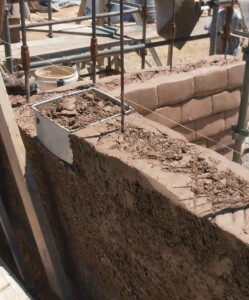 The earth bricks are naturally insulating. Another of Rico’s builds is beautifully warm in the winter, with one stove heating a large two storey house, a house that is also cool in the summer. It’s a lot to do with the overhangs, I’m told. Winter sun reaches in; summer sun is high enough in the sky to be kept out of the house when at its hottest. Sounds good to us. The day we were invited over to see Rico’s current earth-build was a normal working day so we could see bricks being manufactured in situ. To get there, we drove for about an hour south towards Whangarei on a series of windy roads through interesting countryside, and to the east out towards the Heads. 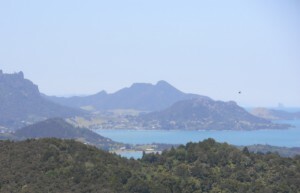 The building site was superb, overlooking the outer reaches of Whangarei harbour and out to sea, an extraordinary section high in the hills, surrounded by farmland and bush with stupendous views. Eat your hearts out, rest of the world – yes, there are building sites here available for ordinary folk – not just the rich and famous – like this one in this beautiful land. The owners, Carolyn and Rob (emigrants from the US), were pitching in just like we propose to do during our build – Carolyn fussing with some impressively large macrocarpa wooden beams and Rob heaping a mixture into a cement mixture consisting of earth, a couple of types of rock, paper, clay, water and a little cement. After adjusting the water content until it was acceptable, he wheeled the mix up huge scaffolding to the top of the walls. One of the builder’s assistants was doing the same, each producing a mix for a separate section. Once they got to their own bit of construction, a metal former was balanced on top of the previous row of mud bricks and filled with the gloopy mixture from the wheelbarrow. Rico took over at that point, lifting the former, smoothing the outside of the brick, emphasising the division between each brick with a few artistic swipes of his trowel and scraping off the inner side of the new brick so plaster can ‘key’ into the earth-bricks when it is eventually applied to the inside of the room. Meanwhile the other two men were back at the work area making more earth mix in their cement mixers. This is hard physical work which is keeping everybody very fit. I bet they sleep well at night. Bob and Rico’s team are almost finished the outer walls. Soon the roofers will arrive and the construction of the inside walls and all that entails will start. Naturally we’re hoping their build goes perfectly smoothly and quickly – both for their sake…and for ours. Later we met with Dave, the man who provides wooden framed windows. So far, we’re pricing up wooden frames for inside the deeply inset windows on the ground floor earth-brick walls and aluminium windows on the second storey which has a more conventional wooden construction. Dave is trying to persuade us to have cedar frames – they go beautifully with the earth-bricks, he says. I’m sure they do. But how much more will they cost? Watch this space – I’ll let you know. But, it really feels like we are moving forward. I must have watched hundreds of “Grand Designs” programmes over the years (Kevin McLeod, you’re the best!). And, yes, this does feel like a Grand Design of our own. I can just see those deep set windows with their wide sills…in cedar…. This entry was posted in Building at The Bay by Tannis. Bookmark the permalink.